Arrangement of "Revive Us Again"
Anyone need a tasty arrangement to "Revive Us Again" as sung by Kim Hill? If so, let me know and I can send you a PDF, complete with horn section if you'd like. All of you fans of the band "Yes" - we'll throw in a little riff for you this weekend. Won't tell you where or when it's happening. We'll try it out in rehearsal tonight. If it works, it'll stick for this weekend. "I was just kidding." That's a phrase my son has started to use. It usually follows something that he's done that he knows isn't right. I ask, "Joshua, did you take that toy from Kayla?" He gives it back to her and replies, "I was just kidding," as he smiles. Sometimes we use the phrase too - we all do. We say we really didn't mean something we said - we were kidding - right?! The next step from "I was kidding" is the "I didn't do it." Whether kidding or denying, both are lies. Yes, you did it - and yes you intended to do it. There's a woman in the Bible who got caught in a small lie. Her name was Sarai. When she was really old, messengers from God came and told her and her husband Abram that they would have a baby. What was Sarai's response. She laughed to herself. What's amazing is that God's messengers called her on it when they didn't even hear her laugh (remember, she laughed to herself). The messengers ask her husband (interestingly instead of her) why she laughed. Sarai denied it. She told a small lie. "I did not laugh." (Gen 18:15) God sees all and knows all. They respond, "No, but you did laugh." Ouch. These guys knew everything - because they worked for the all-knowing God. At times, I've laughed on the inside - wondering how God would turn a situation around. Shame on me - just like Sarai for wondering if something is out of God's reach. From Sarai's example, God doesn't like mistrust. He doesn't like it when we then lie about our mistrust about Him. So I'm here to say that I've doubted God before - and I shouldn't have. That's where I'm so glad that God gives me a second chance, through His mercy, to place my trust in Him. What do you perceive as potentially too big a situation that God may not act in your favor? Don't laugh. Trust Him. God, forgive me when I've laughed at a situation that I thought was too far gone to be salvaged. You really are a God that can do anything. I don't want to mistrust you - with anything...the small stuff and big stuff. Thank You for promising that You care for me and want the best for me. I want to trust You every step of the way - even when things don't seem like they'll pan out. Who's name will you call on? People take sides and jockey for position in every presidential race. Many are claiming the name of their potential candidate. I'm for so-and-so. She's for so-and-so. How could you support so-and-so. When it comes to taking sides, I have a choice. Who's name do I claim. In the spiritual realm, it's the same. I can decide who's name to call on. I can call on His name...or decide to call on something else. While it seems like a no-brainer to be on God's side - there are times in life where man didn't call on the Lord's name (Genesis 4:26). When was the last time I called on the LORD's name? I mean beyond the lunch-time prayers or weekend worship prayers. Do I call on His name to guide me? To reveal my life's direction? To worship Him? Like most parents - I wish for my kids to call on the LORD's name in their life. But what ensures them calling on His name? There's no guarantee. Just like those in Genesis (Cain and Able) - they will decide for themselves who or what they will give worth to in their life. Sure, I want it to the the LORD. And so does the LORD. But, like any good presidential race - God gives each person a choice. God gives me a choice each day if I'll call on Him - who's name will I call on and serve. God. People use your name in so many ways. Sometimes for worship. Sometimes in a cry for help. Sometimes to ask for blessing. Sometimes as they curse. I want my life to call out to Your name. I don't want to rely on myself - or in my name. I don't want to rely on man around me either - on the latest popular presidential candidate, speaker, or influential person. May You have the most influence on my life as I call on Your name - and Your name alone. I also pray for my family - as my kids follow me, that they would choose to call on Your name as well. Use me to show them the way to You - but help me allow them to make the choice for themselves. My brother sent me this link of a performance with 1,000 hands. What's more impressive - the performers are deaf. I wonder when we'll see something as beautiful as this in a service of worship that points people to the creativity of God. Could a performance similar to this one somehow tell the story of Christ? Dirt warning! You are probably reading this thinking you are going to get some dirt on me. Well, you might. Sometimes transparency reveals to much. You know, the TMI factor. And, no, this isn't going to be a sappy Valentines Day plug about me and my wife. You need to understand something first. I'm a musician. So I spend a lot of time up front on stage. While I don't enjoy being there (subject of another post), I spent many hours in college performing. So, I used to date this girl in college. She seemed to love me off-stage. But as soon as I had a concert or performance on stage - she seemed to detest the fact. Why? She felt like I was in the lime light - and she wasn't. The longer we dated, the worse it got...to the point that I felt like our relationship was conditional. She loved me conditionally - only when I was off-stage. Today, I'm a musician and I'm married to a musician. The church in Ephesus lost their first love. After reading the first half of Revelation 2, God let a church in Ephesus know that they had lost their first love (which was God). Sure they acted like they were in a relationship with Him, but God warned if they didn't fall back in love with Him - that He would remove them from the plan He had for them. Ouch! Isn't being removed from God's plan harsh? I thought God was a loving God? He is. That's why He only wants to be in love with us, and us with Him. Everyday I have a choice - to love God or to fall out of love and go my own way. I'm not talking about big things - I'm talking about how I treat the person taking my order behind the counter, or how I respond to my kids when they misbehave. Like that bad dating relationship I was in - I have a choice. Either love the girl or fall out of love and pursue music. The difference with God, is that he's fair and loves me unconditionally - the girl didn't. Staying in love with God is a requirement in order for me to serve His purpose. If I fall out of love, God is patient and will probably give me a warning or two - but ultimately He may decide to remove His purpose/plan from my life. This is what He warned the church in Ephesus, if they continued to have lost their first love. God, I love You today - right now. But that's no promise that I will love You tomorrow. I need to decide every day. I know that there are conditions in my life for how You use me - just like the church in Ephesus. And, God, I don't want to find my self-worth in whether or not You choose to use me in this way or that (or at all). The bottom line is that You desire us to stay in love with You. While my love for You might ebb and flow with coming days - I want You to know that I never want to fall out of love for You. So when You call on me to serve in whatever capacity - I'm available. And if You never call on me to do something - or if I never see how You've used me in your kingdom - I want to be OK with that too. My purpose in life is simply to love You because You first loved me - and to respond to You in light of that fact. Period. Help me to toss aside any 'condition' I've had in the past when it comes to being used by You. Just got an email from Pastor Scott Distler (Grace Church - Lititz, PA) to his entire church that two girls from the church at tending Union University where there when the tornado hit. Both of them were fine. Story link. One of the girls was the daughter of a good friend of mine who leads worship there. Leisey's if you are reading this, our prayers of thanksgiving are with your family today. Thanks God for giving us life and another day. When I was in 6th grade, my house was hit by an F4 tornado in Wales, WI. One person dead, 14 injured. The person who died was the house right before it hit ours. I'd tell you the full story, but it's kinda long and not pertinent for this blog. But you can see pictures and read the full story at this link. You can see my house in one of the photos at the link...I'll let you guess which one. Since then, I follow weather closely and even thought I'd study it someday. What we know (or rather don't know) about a tornado is interesting. 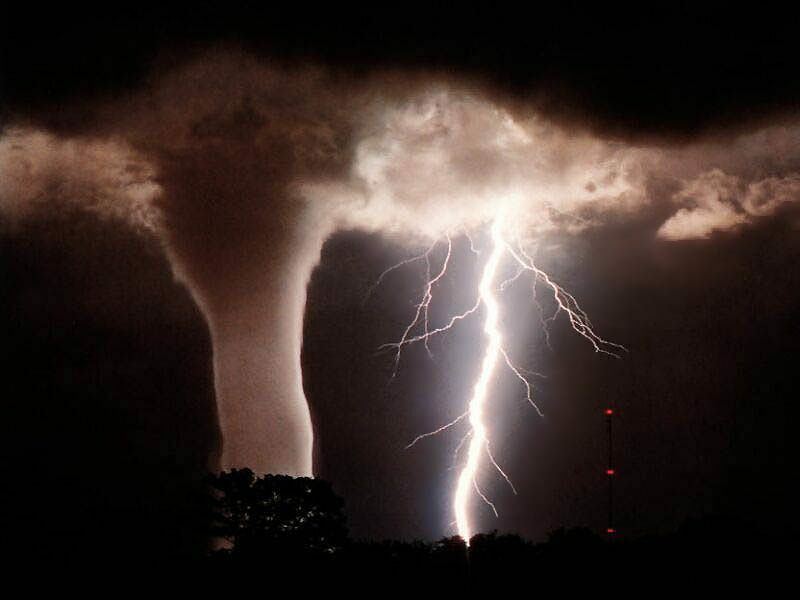 Meterologists and scientists still can't figure out exactly what causes a tornado to form. You can see a tornado. You see its force. You can research what's happening up to the point of formation and what's happening as a tornado exists - but no one really knows all the exact conditions needed to form a tornado. That's how God is like a tornado. You know God exists. You can see His effects. You can see evidence that He's been there and has been working. But no one can really explain the conditions of how He works - or how He exists before time began to begin with. Our finite minds simply can't understand - or it hasn't been revealed to us. Job 36:26-29 "How great is God--beyond our understanding! The number of his years is past finding out. He draws up the drops of water, which distill as rain to the streams; the clouds pour down their moisture and abundant showers fall on mankind. Who can understand how he spreads out the clouds, how he thunders from his pavilion?" We believe tornadoes exist. What about God? By the way, you can read what they know about how tornados form at this link. Sometimes people ask me, "What's your favorite music?" That's hard to answer. It depends on the day and the mood. Music that sets my heart and eyes on who God is - is especially engaging. What music is that? Again, it depends on so many variables. Sometimes, it's brass & organ. Other times symphonic rock. Yet other times, it's really far out stuff...like Spectral Voices. Spectral Voices is a group that sings in a watertower. Yes, watertowers. It's a combination ot throat singing, whistling, and other odd vocal gymnastics that produce an erry and awe-inspiring sound. Does it cause me to worship? Sometimes when I listen to it, yes it does. How does it cause me to worship? It reminds me of how incredible God has designed our voices and ears to experience acoustic wonders like these. We couldn't sing or hear these sounds or even conjure up the sound-scapes unless God gave us the ability. God is so creative. It begs the question what music will be like on the other side of this life. Will we be able to hear an infinate range of sound? Will we be able to 'hear' more than the audio frequencies we do now? Will we be able to 'see' sound? Will it be a Pink Floyd concert on steroids - or more? Catch them at the iTunes store here. It's been awhile since I've led a whole service of worship leading music from the keyboard. I've come to prefer the guitar to lead worship. I'm not near as gifted at leading from the keyboard as a Matt McElravy, worship leader at Grace Church (Lititz, PA). Matt has the voice and the smoothness on a keyboard to pull it off. He has the looks to. I have none of the above. So why did it come off well this morning? Let's see - the band covers for me musically (I can sit back on verses or play more simply) and a change up in routine can give new life. Next week - big change up. Playing the sackbut. Maybe we should try some HangDrums (pronouced hung drum) sometime. Check it out below or more here at www.danwilt.com.